AUniversity of Guelph student has been fined $400 for looking at the time on her Apple Watch while driving a vehicle in Ontario, Canada. According to U of G News, Victoria Ambrose was driving her vehicle when a she was pulled over by a campus police officer. Ambrose was stopped at a red light when the officer noticed there was glow of a device coming from inside the vehicle. With Ambrose noticeably looking up and down at said device, she became unaware that the light had in fact turned green. The student was pulled over and fined for driving while holding a communication device in accordance to the Ontario Highway Traffic Act. The 2009 amended law for distracted driving states that no person shall drive a motor vehicle on a highway if the display screen of a television, computer or other device in the motor vehicle is visible to the driver. In the subsequent hearing, the court was to rule whether the Apple Watch should be considered a handheld device that would apply to said law. During her testimony, Ambrose argued that she had been looking at the Apple Watch and the screen happened to deactivate, which is why she had to touch the screen to reactivate it. The defense also argued on Ambrose’s behalf that the Apple Watch was not a hand-held device but in fact, more akin to a hands-free Bluetooth device. Justice of the Peace Lloyd Phillipps rejected both arguments. “Despite the Apple Watch being smaller than a cellular phone, on the evidence, it is a communication device capable of receiving and transmitting electronic data. While attached to the defendant’s wrist, it is no less a source of distraction than a cell phone taped to someone’s wrist. It requires the driver to change their body position and operate it by touch.” said Phillipps. Phillips also ruled that there were differences between a Bluetooth device and the Apple Watch is question, noting that a Bluetooth device does not have a screen. 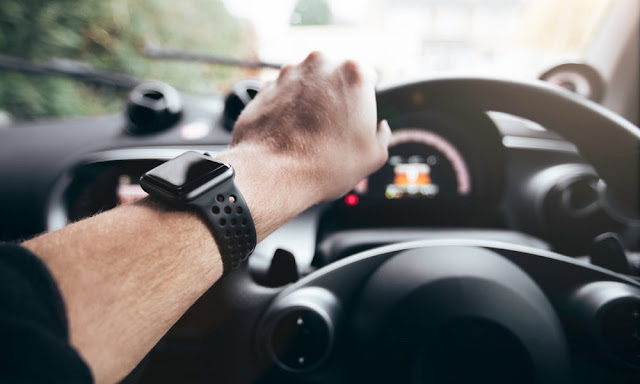 This is not the first case in which someone was fined for using an Apple Watch while driving in Canada: In 2015 a man was fined $120 after being pulled over in Montreal for using his device while behind the wheel. Ambrose has been ordered to pay a fine of $400 in the next 90 days.